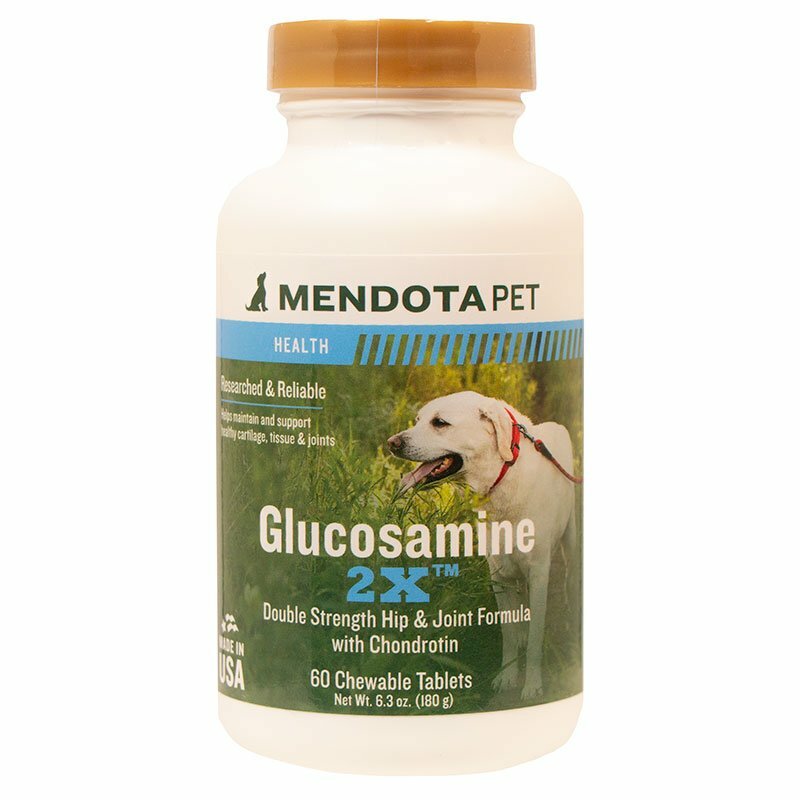 Glucosamine 2x by Mendota Pet. $18.99. "Great product at a reasonable price." Oldest dog, Lab/Australian Shepherd mix with arthritis, has made a remarkable recovery. Returned to very active life, running easily, no more limping, and only minor stiffness when getting up from rest. Great product at a reasonable price. "Has done wonders for my 8 year old Lab"
Has done wonders for my 8 year old Lab. He is a retired police dog and loves the glucosamine. Best glucosamine I found for the money. Some might be better but cost a lot more. Some might be cheaper, but you have to give twice to three times as many. My 140lb lab mix shows no limping with these. If I forget to get a bottle he limps a little to show some stiff joints. These seem to make it all go away. My 11 year old pointing lab still hunts with a lot of pep and stamina that matches or out performs other dogs half her age. I'll be giving her this product as long as she lasts. We've only been using this for two weeks on my 11 year old Brittany. So far, it seems to be helping. Veterinarian recommended and scientifically formulated for hip and joint lubrication. 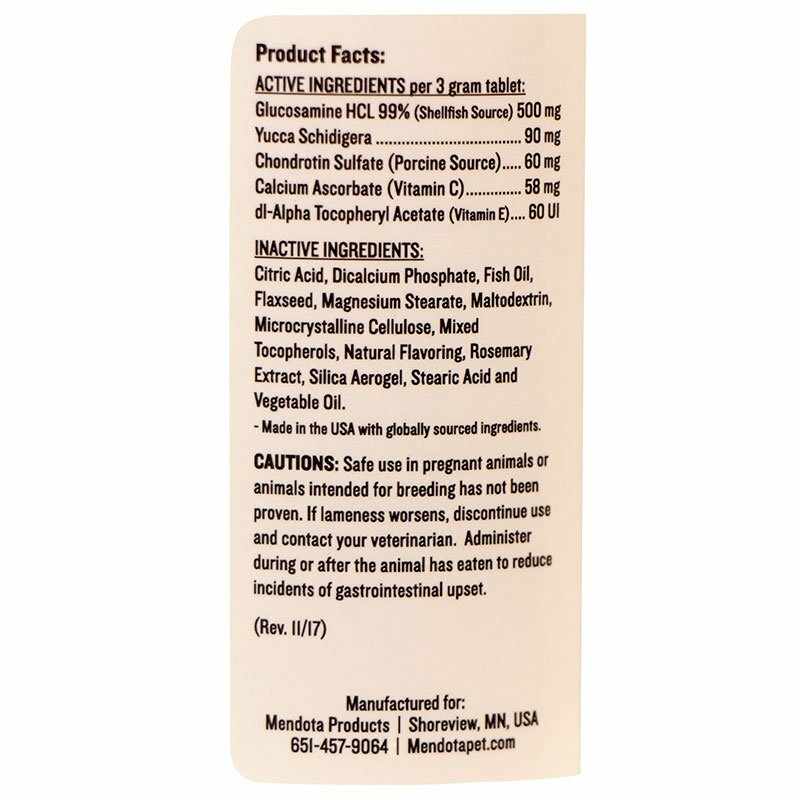 Mendota Pet GLUCOSAMINE 2x with Chondroitin is veterinarian recommended and scientifically formulated for hip and joint lubrication, plus actual repair of cartilage and ligaments. GLUCOSAMINE 2x contains pharmaceutical grade vitamins and minerals to ensure you are providing the highest quality ingredients. These all-natural active ingredients give your dog relief from swelling and arthritic symptoms alleviating aches and pains. GLUCOSAMINE 2x with Chondroitin contains essential antioxidants that help protect against free radicals that cause cellular damage. Dicalcium Phosphate, Fish Oil, Magnesium Stearate, Maltodextrins, Microcrystalline Cellulose, Natural Flavoring, Non-Fat Dry Milk, Rosemary Extract, Silica Aerogel, Stearic Acid and Whey. For use in dogs only. Recommended to support healthy hip and joint function. Helps to maintain joint flexibility and alleviate aches and pains associated with exercise. Your dog seems to be moving a little slower and you may have noticed a slight limp. Your Vet tells you your dog needs Glucosamine. So you buy it, but will it actually work? In some trials Glucosamine has been shown to be effective at easing joint discomfort and increasing flexibility while other trials show little to no benefit. So what is the truth? What is missing in nearly all of the studies is the actual method that the Glucosamine was prepared. I will attempt to shine some light on this much recommended amino sugar known as Glucosamine. Glucosamine for the most part comes from crustacean shellfish such as crabs, crayfish, lobster and shrimp. Glucosamine is an amino sugar that is utilized by the body to support healthy joint structures. It is unlike other sugars in that it is incorporated into the structure of tissues rather than being used as an energy source. 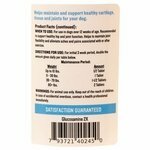 Glucosamine is important for the formation and maintenance of your dog's nails, tendons, skin, eyes, bones, and heart valves. It also plays a role in the mucous secretion of the digestive, respiratory, and urinary tracts. 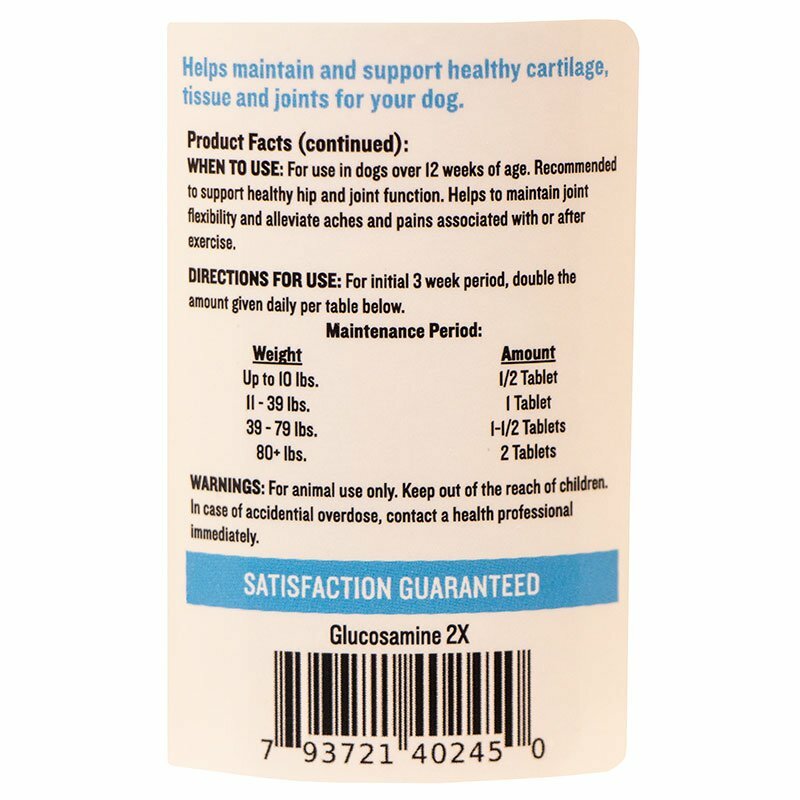 Pharmaceutical grade Glucosamine is ideal for your athletic dog or those with arthritis or joint pain and is very beneficial as both a preventative measure as well as for helping to combat existing problems. Glucosamine absorbs and releases water with each step and thereby acts as a shock absorber for the joints offering long-term protection for current or retired athletes. Glucosamine stimulates the formation and repair of articular cartilage. Glucosamine forms the building blocks of vital compounds called mucopoly-saccharides, which are necessary for the construction and maintenance of virtually all connective tissue and lubricating fluid in the body, including tendons, ligaments, cartilage and synovial (joint) fluid. Method 1): The vast majority of the Glucosamine supplied for animals are processed through poorly effective methods of crushing and cutting. Crushing employs hammer-like tools to break the solid into smaller particles by means of impact. Cutting uses sharp blades to cut the rough solid pieces into smaller ones. These inexpensive processes leave the particles in such large pieces that the ability for an animal to break them down to a usable amino sugar is extremely difficult. It allows some manufacturers to place "Contains Glucosamine" on their packaging but the utilization is dismal at best. Method 2): Traditional micronization techniques are based on friction to reduce particle size. This method includes milling and grinding using cylindrical metallic drums that usually contain steel spheres. As the drum rotates the spheres inside collide with the particles of the solid, thus crushing them into smaller diameters. In the case of grinding, the solid particles are formed when the grinding units of the device rub against each other while particles of the solid are trapped in between. Method 3): Modern pharmaceutical methods use supercritical fluids in the micronization process. In this method supercritical fluid is used to dissolve the solid material under high pressure and temperature, forming a supercritical gas phase. The particles formed this way have a diameter of a few hundred nanometers. Studies show absorption rate of these particles are thousands of times better than those of crushing and hundreds of times better than grinding. The same process is true for any of you dog owners who are personally taking Glucosamine. Make sure you too are taking only the best. In summary, SIZE REALLY DOES MATTER. 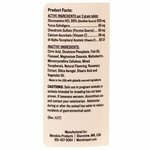 A Fisher Footnote: Many ask "Why do many products also add Chondroitin?" Answer: Along with Glucosamine, Chondroitin has become widely used for treatment of Osteoarthritis. Osteoarthritis is a type of arthritis characterized by the breakdown and eventual loss of cartilage, either due to injury or to normal wear and tear, and commonly occurs as dogs age. Chondroitin helps to keep cartilage healthy by absorbing fluid. Mendota Pet uses Bovine Trachea as an excellent source of Chondroitin.